Your order will ship MONDAY if placed in the next 21 hours 4 minutes . Enter your shipping address zip code to receive an instant delivery date estimate from UPS. Browning Long Range Pro 30-06 Springfield Ammo 195 Grain Sierra MatchKing BTPT for sale online at cheap discount prices with free shipping available on bulk 30-06 Springfield ammunition only at our online store TargetSportsUSA.com. 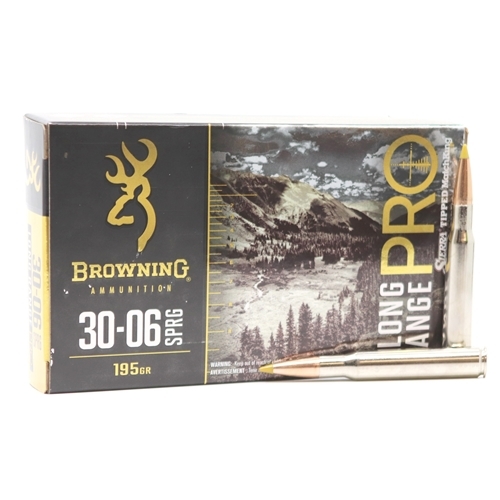 Target Sports USA carries the entire line of Federal Non-Typical Ammo for sale online with free shipping on bulk ammo including thisBrowning Long Range Pro 30-06 Springfield Ammo 195 Grain Sierra MatchKing BTPT. Browning Long Range Pro 30-06 Springfield Ammo 195 Grain Sierra MatchKing BTPT review offers the following information; Browning Long Range Pro achieves match grade accuracy through the utilization of Sierra Tipped MatchKing bullets. Whether its punching holes in paper or ringing longrange steel targets, Long Range Pro delivers with precision. The Matrix Tip projectiles are engineered to exhibit rapid expansion specifically for whitetail, blacktail, mule deer and antelope. Browning has been producing high quality firearms since 1878 and started offering their customs ammunition as of 2016. Browning ammo is made possible due to a partnership with Winchester, who is responsible for developing and manufacturing the ammo in their Alton, Illinois facility. Browning is offering a complete line of pistol, rifle, shotshell and rimfire ammunition for several different shooting applications. Browning is offering a complete line of pistol, rifle, shotshell and rimfire ammunition for several different shooting applications. Muzzle Energy 3040 ft. lbs. Browning Arms Company was founded in Morgan Utah in 1927. Browning makes everything from firearms to accessories and equipment. Their top selling products are the BPS UPLAND 20/22 IP, BPS HNTR 20/26 3"" INVCTR and BPS HNTR 12/28 3"" INV. Target Sports USA carries Browning Arms Company products for sale online with best selection to choose from.